Inferences? For a fifth grader, identifying these ideas may sound confusing. Giving your child a news article and asking him to identify first, the conclusion and then, the supporting statements will help him organise his thoughts. Then identifying inferences will be easier and less painful. Pick an article out of the local newspaper or from an on-line news source about the environment, such as global warming. Have your child read the article. 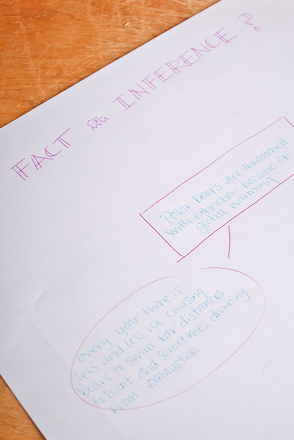 Discuss the article with your child and ask him to formulate a conclusion. Ask him what statements in the article led him to his conclusion. Was it the expert quote? The supporting chart? The in-depth analysis? Have your child create a web chart to display his ideas. Ask him to write his conclusion in the centre of the chart. For example, he might write, “Polar bears are threatened with extinction because of global warming.” Then ask him to write the statements that support the conclusion in ovals surrounding the conclusion. For example, “Every year, there is less and less ice, causing bears to have to swim far distances to hunt and sometimes drowning from exhaustion.” Have him link the ovals to the statement. Discuss the meaning of inferences with your child. Remind him an inference is an idea that is suggested, but not stated as a fact. Ask him to draw a couple of inferences from the article about global warming. Then have him write those on the chart. Have him draw a box around each inference and link it to the conclusion. Ask your child to give an oral presentation about the article to family members using his web chart, and explaining how he reached his conclusion using inferences. Understanding the difference between fact and opinion is a critical skill. 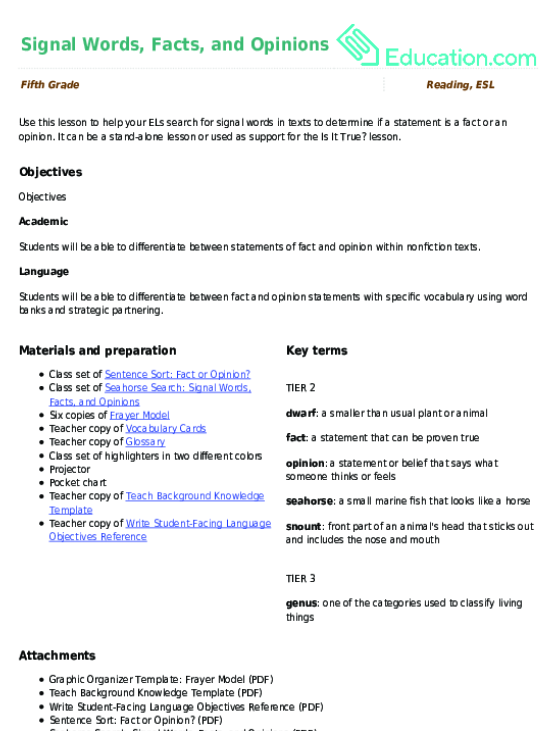 In this lesson, your ELs will learn how to differentiate statements of fact and opinion in a nonfiction text using adjectives as a foundation for their understanding. 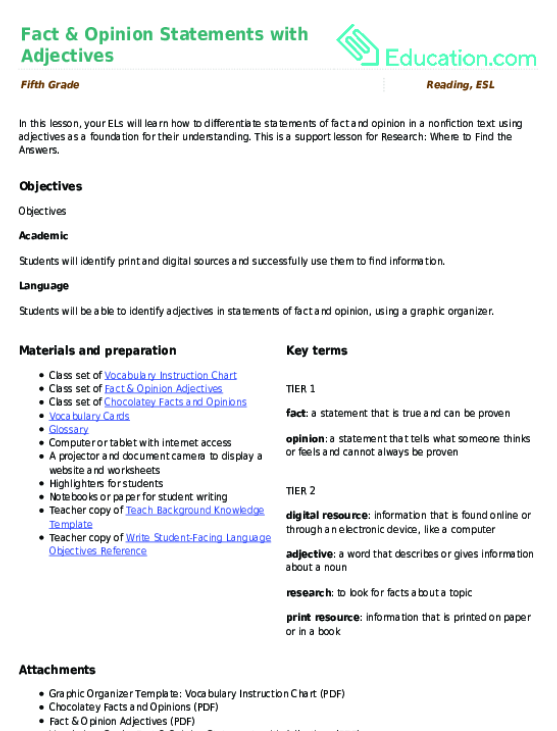 Use this glossary with the EL Support Lesson: Fact & Opinion Statements with Adjectives. Use these vocabulary cards with the EL Support Lesson: Fact & Opinion Statements with Adjectives. If your child is reading a novel for school, encourage him to draw parallels to the real world in this fun news scavenger hunt.